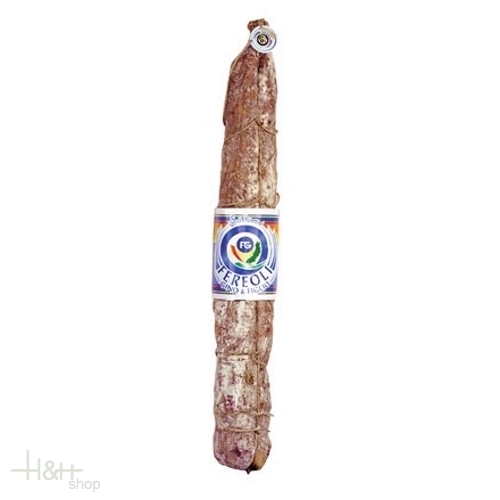 Pure pork salami of the Province of Parma, produced with lean chuck, medium ground in natural casing. Parma is the Italian capital of cold cuts, right here on the Parmesan foothills Fereoli Gino & Son snc produces the typical Felino salami, the best Italian salami according to experts. The traditional production of Felino Salami dates back to the mid-18th century, when some master butchers of the town of Felino (hence the origin of the name), a country village about 15 km Parma, began to create this delicious salami. Felino hasn't changed much since then, it's still produced with the same care in the selection of raw materials, the drying and the long maturation that takes place in large non-ventilated rooms. Stuffed into natural gut, given the high quality of the raw material used (only the best parts of the pork are used, the meat must be fresh and not frozen and pigs raised and slaughtered in Italy) to which only a few grains of black pepper must be added, this is because the addition of many spices covers the taste and fragrance which are the main characteristics of this sausage. The best Felino still melts in your mouth after 70/80 days thanks to its softness, resulting a slow maturation, which makes it unique in the panorama of Italian salami. today Luigi and Luca Fereoli still produce in the same manner of the master butchers what is an essential component of the typical Parmesan gastronomy.